MicroMatrices are pleased to announce the publication 5 February 2019 of a paper entitled “A Human iPSC-derived 3D platform using primary brain cancer cells to study drug development and personalized medicine” in Scientific Reports. 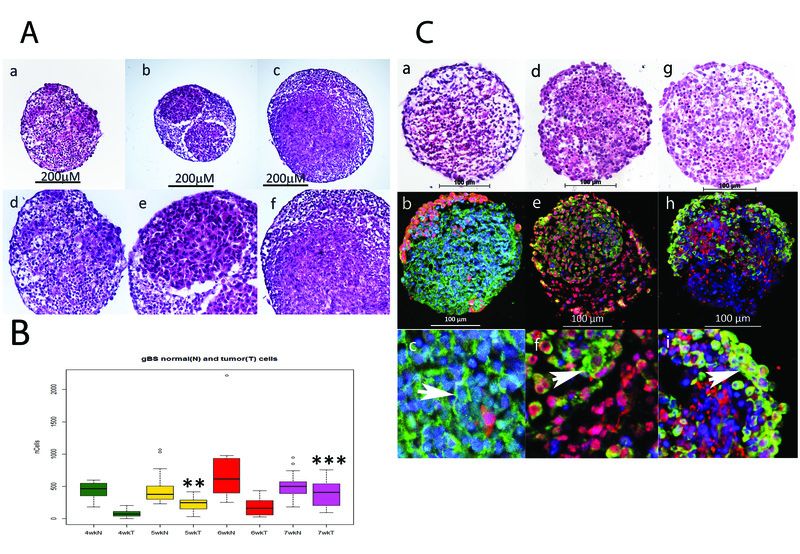 This landmark paper describes the application of our proprietary SpheroMatrices microTMA technology in a heterotypic human glioblastoma model containing normal neuronal cells and tumour cells in the same 3D organoid. 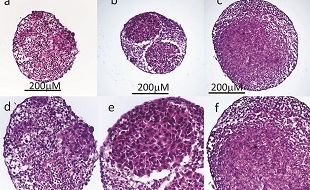 Using multiplexed immunostaining and quantitative image analysis of microTMA sections produced with SpheroMatrices technology, we were able to visualise and quantitate tumour cell growth vs normal neuronal cell growth in response to in-life treatment of the spheroids with either Temozolomide or Doxorubicin. Furthermore, we found that the anti-tumour effects of doxorubicin, an experimental therapy for this disease, were mediated in part by selective induction of apoptosis in the glioblastoma cells relative to the normal neuronal cells. The publication demonstrates an application of the microTMA technology for both drug discovery and personalized medicine. It also demonstrates the power of multiplexed immunostaining (up to 7 markers per slide) in physical sections, uniquely facilitated with the SpheroMatrices platform, to more fully characterise biological responses of a 3D organoid experiments. For further background, please see our press release. Figure: Growth of glioblastoma tumors in the gBS model. Panel (A) shows the number growth of glioblastoma cells and nontumor (normal) cells in the gBS spheroids over time (4–7 weeks). a–c H&Es (x10); d–f H&E (same sections x25) Panel (B) box plots of image analysis data showing total number of glioblastoma cells and total number of normal neuronal cells in the gBS over the time course (3–7 weeks) expressed as the total numbers of cells in the spheroid section. Panel (C) Shows representative H&E and GFP/Tuj1, GFAP/O1 and Vimentin/NF200 dual IF staining photomicrographs of untreated gBS (parallel sections): a, H&E; b, GFP(red)/Tuj1(green) IF staining at low power (x20); c GFP/Tuj1 IF staining at high power (x63); d, H&E; e, GFAP (red)/O1 (green) IF staining at low power (x20); f, GFAP/O1 IF staining at high power (x63); g, H&E; h, NF200 (red)/vimentin (green) IF staining at low power (x20); i, NF200/vimentin IF staining at high power (x63). Blue staining is DAPI (nuclear counterstain).